The Palfrey surname originates in England, although our origins within that country are unknown. The word Palfrey refers to a type of horse saddle that was used in the Middle Ages that was used for general everyday riding. An ancestor of the Palfrey family may have had an occupation that had something to do with these kinds of horses. Thomas Palfrey was born in 1796 1 in England. He died in 1875 1 in Waukau, Winnebago Co., Wisconsin. He is buried in the Waukau Cemetery, Waukau, Winnebago Co., Wisconsin. As of yet, we have not been able to determine Thomas' origins in Great Britain. Based on the names of his children and traditional naming patterns, an educated guess is that his parents may have been named John and Eliza or Anne. He is first found in records in 1816, when he married in Radnorshire, Wales. Later US census records suggest that while his wife and children were born in Wales, Thomas was born in England. If that is true, it is perhaps most likely that he came from a western English county, near the border with Wales. One unverified guess for his origin is a Thomas Palfrey, son of John and Eleanor, who was baptized on March 8, 1795 at Aston near Ludlow, Herefordshire, England. His known siblings were William, Mary, John and Ann. Aston near Ludlow is only about 20 miles from the places in Wales where Thomas lived as an adult. To add to this possibility, this Thomas' brother William later lived in Radnorshire, Wales and his sister Mary Palfrey was married to a John Jones (note that when Thomas Palfrey married Jane Jones, a John Jones was one of their witnesses). Although this connection seems plausible, it is not (yet) corroborated by any records. Another unverified guess is a Thomas Palfrey who was baptized on June 24, 1796 in Milverton, Somerset, England, the son of Thomas Palfrey and Ann Broadmead, and had at least one sister named Elizabeth. So far, DNA tests have not been able to connect our American Palfreys to their English cousins. However I do have two autosomal DNA matches with people who descend from Palfrey families that lived in Suffolkshire, England in the late 1700s. Perhaps our Thomas Palfrey actually came from Suffolk. Certainly the amount of times that he moved as an adult would support the suggestion that he moved to the other side of his country as a young man. If that's true though, then he is probably not the same person as either of the two Thomas Palfreys listed above. Thomas was married to Jane Jones on June 24, 1816 in Llanyre Parish, Radnorshire, Wales. Since their first child was baptized only three months later, it might have been something of a "shotgun wedding." Although we do not know exactly when Thomas or Jane were born, most known records agree that Jane was older than Thomas. At the time of the marriage, Thomas was about 20 and Jane was about 26. Over the next ten years, Thomas and his family lived in Radnorshire in central Wales, but moved frequently within the county. In 1816, they were at Wern-Hyre in Llanyre Parish. After this they moved to nearby Llangynllo Parish, where they lived in a variety of locations. In 1819 they were at "Bays's or Pantppunon", in 1821 they were at Nenaddvach, in 1823 they were at Llangynllo Village and in 1826 they were at Tynygraig. During this time period, Thomas' occupation was listed variously as farmer, laborer, bailiff and flour dealer. Sometime after 1826, the family moved away from Llangynllo Parish and probably lived elsewhere in Great Britain for a few years. Their son Thomas was born probably in 1827 at an unknown location in England or Wales. In about 1829, they left Great Britain permanently and moved to Canada. Their daughter Mary was born in October 1829. Most sources indicate that she was born in England, yet one source (the 1920 census of her son) specifically indicated that she was born "at sea". If that's true, then an emigration in October 1829 would fit well with other records that suggest they left Great Britain at about that time. However when his son William applied for citizenship in 1846 he indicated that he moved to the United States in May 1829. However since the family definitely lived in Canada until at least 1831, he may have been referring to when they migrated to Canada, or he may have been simply mistaken. In about 1829 the family settled somewhere in Quebec, Canada. They did not remain there long because Thomas was "discontented" with Canada. In November 1831, the family moved to the U.S. through the port of Buffalo, New York 9. The family settled in Erie County, New York; where they lived northeast of Buffalo in either the town of Newstead or Clarence. In the 1840 census, Thomas' eldest son John is head of a household with a total of four inhabitants (it is not known where the other 6 members of the family were at the time). It was while living in Erie County, New York, that their eldest daughter Anne died in 1844. Thomas and his family decided to move once more. In 1846, they traveled via the Great Lakes to Milwaukee, Wisconsin, and then took teams inland to Winnebago County, Wisconsin, where they settled in the fall of 1846. The Palfreys apparently moved often within Winnebago County, but always resided somewhere in the vicinity of the village of Waukau. In 1867, Thomas' wife Jane died. The following year, in nearby Portage County, Wisconsin, he married a widow named Melissa Curtis. Interestingly, Thomas knew Melissa and her family many years earlier in New York and they were neighbors in 1840. Neither Thomas and Melissa have not been located in the 1870 census. Thomas owned a house and vacant lots in the village of Waukau as well as about five acres of land outside the village. They were living in Waukau in 1873 and his widow was living there in 1875. Thomas wrote his will on February 20, 1873. In his will he directed that his widow was to have use of his house and that she would be paid financial support out of his estate for the duration of her life. He left his Waukau real estate to be divided equally between his daughters Mary and Eliza, he left his 5-acre tract of land to his grandsons William and Grant Palfrey, and he left some other money to his surviving sons John, Thomas and Richard. Thomas died sometime in 1875 according to his tombstone. He had definitely died before May 31, 1875 when his will was submitted in probate court. Most likely he had died in March 1875, and he was probably the "M R Palfrey" (i.e. Mr. Palfrey) in a transcribed index to Winnebago County newspaper items on March 11, 1875 with the citation that he was "buried last week." He was married first to Jane Jones on June 24, 1816 in Llanyre, Radnorshire, Wales 6. She was born in 1790 1 in Wales and died in 1867 1 in Winnebago Co., Wisconsin. She is buried in the Waukau Cemetery, Waukau, Winnebago Co., Wisconsin. Jane was born sometime between about 1787-1790 in Wales, but her origins are unknown. Based on the names of her children and traditional naming patterns, an educated guess is that she was the daughter of a William Jones and Eliza or Anne. A John Jones was one of the witnesses on her marriage record; perhaps a relative. It is an assumption that Jane came from somewhere in the vicinity of Llanyre, Radnorshire, Wales, where she married in 1816. If that is true, two unverified guesses for her identity are a Jane Jones, daughter of John, who was baptized on July 12, 1789 in the nearby parish of Nantmel and a Jane Jones, daughter of Thomas, who was baptized on May 28, 1791, also in Nantmel. 1 John Palfrey was born on about August 17, 1816 in Llanyre, Radnorshire, Wales. He was baptized on September 1, 1816 in Llanyre, Radnorshire, Wales 6. He died on September 8, 1888 in Rushford Twp., Winnebago Co., Wisconsin 1. He is buried in the Waukau Cemetery, Waukau, Winnebago Co., Wisconsin. 2 William Palfrey was born in about March 1819 in Llangynllo, Radnorshire, Wales. He was baptized on April 2, 1819 in Llangynllo, Radnorshire, Wales 7. He died on November 16, 1851 in Winnebago Co., Wisconsin 1. He is buried in the Waukau Cemetery, Waukau, Winnebago Co., Wisconsin. 3 Anne Palfrey was born in about November 1821 in Llangynllo, Radnorshire, Wales. She was baptized on December 1, 1821 in Llangynllo, Radnorshire, Wales 7. She died on June 1, 1844 in Erie Co., New York 8. She is buried in the Clarence Fillmore Cemetery, Clarence, Erie Co., New York. 4 Eliza Palfrey was born in about October 1823 in Llangynllo, Radnorshire, Wales. She was baptized on October 12, 1823 in Llangynllo, Radnorshrie, Wales 7. She died on February 24, 1907 in Rushford Twp., Winnebago Co., Wisconsin 4. She is buried in the Waukau Cemetery, Waukau, Winnebago Co., Wisconsin. 5 Jane Palfrey was born in about March 1826 in Llangynllo, Radnorshire, Wales. She was baptized on March 18, 1826 in Llangynllo, Radnorshire, Wales 7. She died on September 25, 1850 8. She is buried in the Clarence Fillmore Cemetery, Clarence, Erie Co., New York. She was never married. She apparently remained behind in New York when her entire family moved out west to Wisconsin in 1846. 6 Thomas Palfrey was born in June 1827 in England 3. He died on July 14, 1907 in Waukau, Winnebago Co., Wisconsin. He is buried in the Waukau Cemetery, Waukau, Winnebago Co., Wisconsin. 8 Richard Palfrey was born on June 28,1831 in Quebec, Canada 1. He died on June 7, 1914 in Rushford Twp., Winnebago Co., Wisconsin 1. He is buried in the Waukau Cemetery, Waukau, Winnebago Co., Wisconsin. He married second to Jennie Allen on September 25, 1888 in Winnebago Co., Wisconsin. (She was born in May 1844 in Scotland 3 and died before March 7, 1919 in Winnebago Co., Wisconsin). He married second to Melissa Colby, widow of Benjamin Curtis, on May 18, 1868 in Belmont, Portage Co., Wisconsin. She was born circa 1806 in Vermont and died circa 1889-1890, probably in Portage Co., Wisconsin. Melissa and her first husband Benjamin Curtis lived in both Erie County, New York and in Westminster, Ontario, Canada. Sometime between 1851 and 1860, Benjamin died and the family moved to Portage County, Wisconsin. Melissa had at least 6 children: Lucy, Edwin, Robert, Abigail, Merritt and Clark Curtis. During her marriage to Thomas Palfrey between 1868 and 1875, they apparently lived together in Waukau, Winnebago County, Wisconsin. 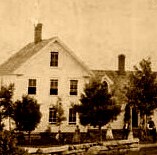 She was living there in June 1875, shortly after his death. In his will, Thomas directed that his heirs provide her with financial support. He also directed that she was to have use of his house in Waukau for the duration of her life. In spite of that, she did not remain there and moved back to Portage County, Wisconsin to live with one of her children. She was living there in 1880 and 1885. Melissa had definitely died sometime between 1885 and 1891, yet she probably died in 1889 or 1890. On September 28, 1891 Melissa's step-daughter-in-law Eliza Palfrey described Melissa as deceased when she went to court to finally close the estate of Thomas Palfrey, her deceased father-in-law. Her statement makes reference to paying Melissa's sickness and burial expenses in January 1890. Mary Palfrey was born on about October 5, 1829 5, apparently at sea, enroute from England to Canada. She died on January 20, 1882 in Garden City, Blue Earth Co., Minnesota 5. She is buried in the Garden City Cemetery, Garden City, Blue Earth Co., Minnesota. Although nearly all sources (census enumerations) indicate that Mary was born in England, the 1920 census of her son Henry indicates that his mother was born "at sea." It would make sense then that she was born somewhere at sea, while her family was moving from Great Britain to Canada. We do not have any record of when exactly the family left England. Her older brother Thomas was born in England in 1827 and her younger brother Richard was born in Quebec in 1831. Other sources also point towards an emigration in about 1829 or 1830. Mary spent the first few years of her life with her family in Quebec, Canada, but they did not remain there for long. In November 1831, she moved with her family to Erie County, New York. In 1846, her family moved out west to Winnebago County, Wisconsin. Mary did not remain unmarried for long and on March 30, 1848, at the age of 18, she was married to Henry Bixby. They afterwards settled on a farm near her family near the village of Waukau in Winnebago County, Wisconsin. Mary and Henry had 6 known sons: Alvin, Herbert, Augustus, John, Henry and William. For whatever the reason, they did not remain in Wisconsin. In 1866, they moved west and settled on a farm near the village of Garden City, in Blue Earth County, Minnesota. (Mary and her family may have lived briefly somewhere else in Minnesota before settling near Garden City). Although they farmed a variety of crops here, it seems that their primary agricultural holdings were sheep. Mary spent the rest of her life near Garden City, Minnesota. She died there on January 20, 1882 at the age of 52. Her cause of death is unknown, but given that two of her brothers died from the effects of diabetes, it is possible that she too had this disease. She was married to Henry Albert Bixby on March 30, 1848 in Rushford Twp., Winnebago Co., Wisconsin 2.